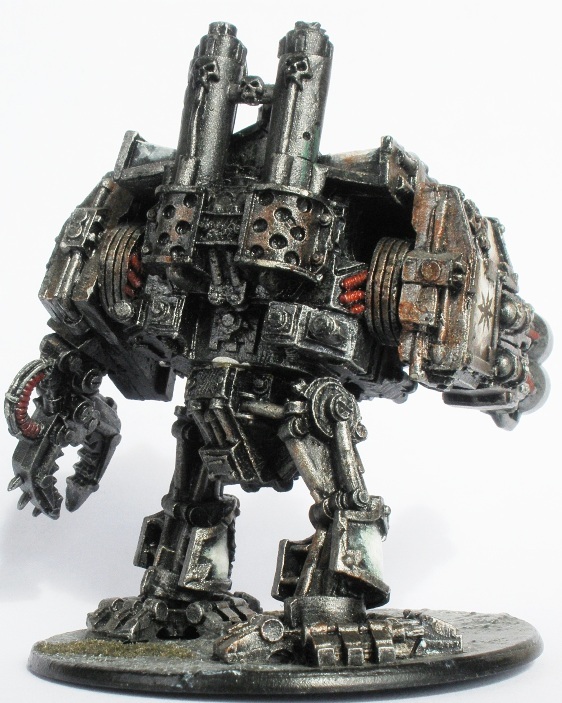 As early playtesting went on using my Sin Eaters (way back in 1999) it looked like getting a second Dreadnought on the table would be fun. 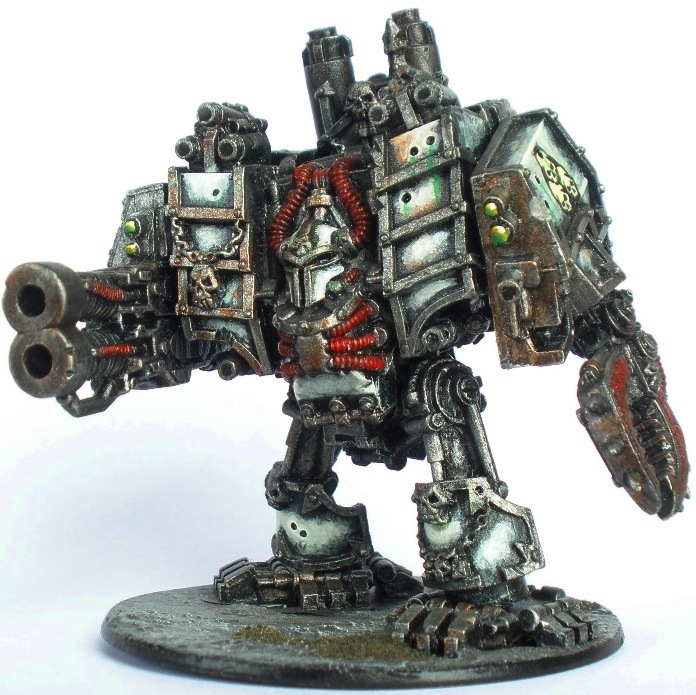 While Brother Rhinox was made more or less exclusively from the basic metal chaos Dreadnought kit, Tankorr was made from a metal Imperial Dreadnought, albeit an Imperial Dreadnought with loads of spiky death metal type junk stuck on. Examples above include the spiky panels on the main housing and the tombstone-for-a-face. 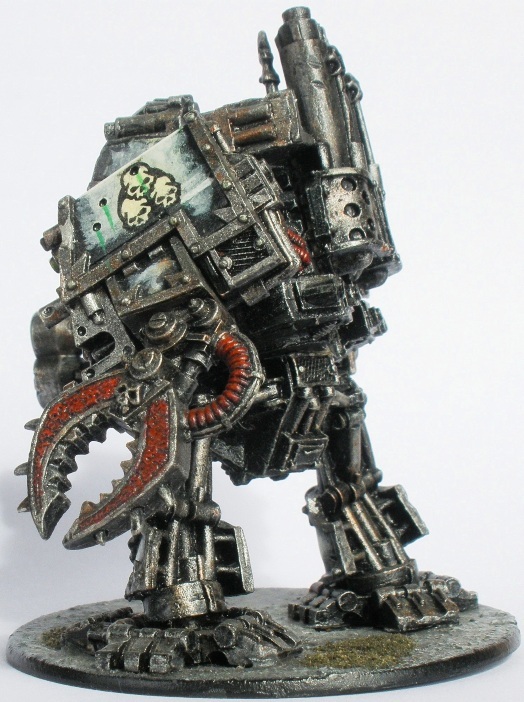 Tankorrs huge and ludicrous close combat arm. Tankorrs arms were made from spares from the kit that was used to make Rhinox. 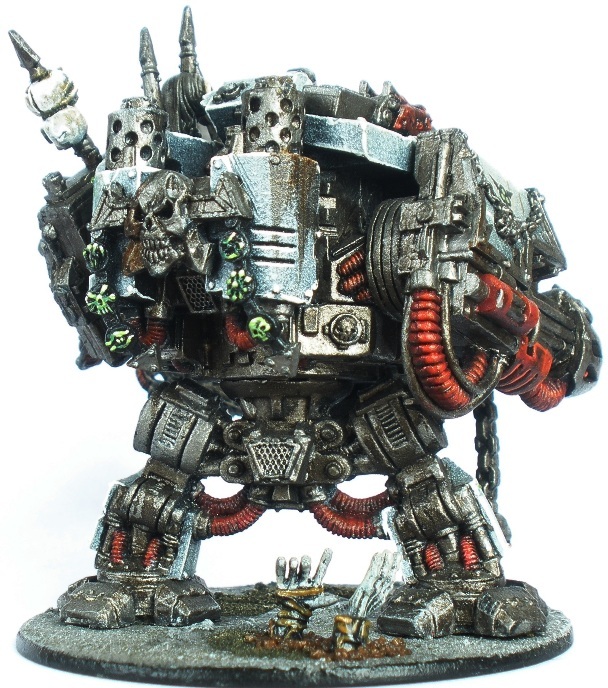 The left arm above had an Ork Choppa and two Necromunda Pit Slave weapon arms attached. I also added another pit slave chainsaw bit to the front of the body on that side for good measure. In the above shot you can make out bits where some of the many spikes attached to the figure used to be attached, only to have broken off at various points over the years. The lesson here is simply not to bother sticking those things on in the first place. If Tankorr gets away with it it is simply because of the zombie-like, dilapidated look. 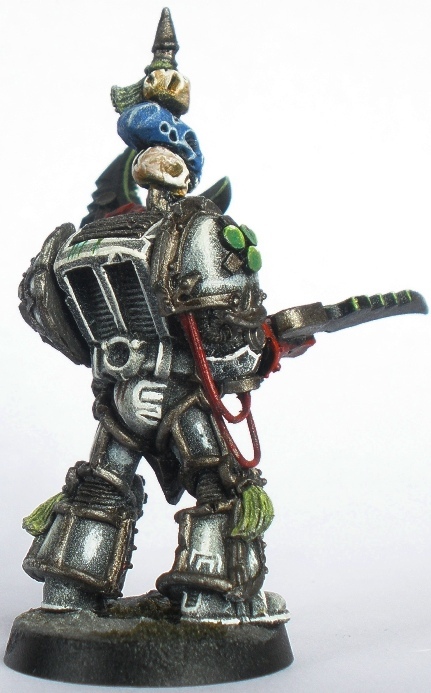 I like the combi-bolter mounted on Tankorrs shoulder for some reason that I cant put my finger on. I also like the silly zombie hands bursting out of the ground, “Thriller” style. Lord Zarak is pretty ridiculous looking really, but I like him all the same. 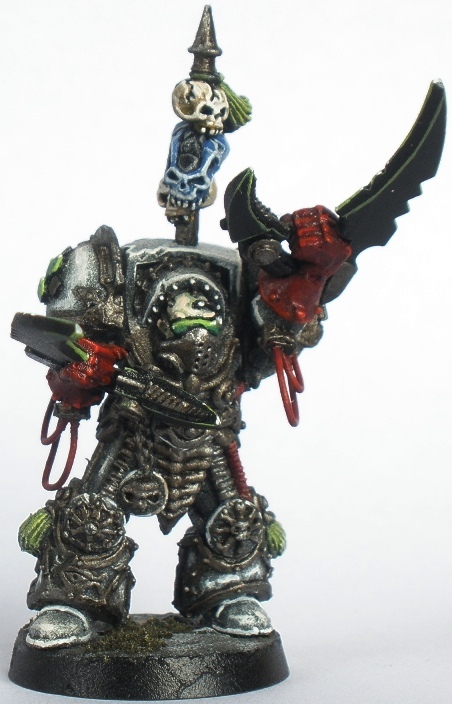 I had had a chaos terminator captain figure for a while but hadnt got around to painting him. He was an older figure than those used in Squad Romero and was a little more slight. I wanted to give him something that would make him stand out dramatically from the other Terminators, but didnt know what. It dawned on me to use parts of the whip arm thing (cant remember what it is called) from the parts left over from the Brother Rhinox kit to make the inner “thumbs” of his scorpion-like Lightning Claws. The larger, totally OTT parts of the claws are made from bits of a plastic dozer blade from some Imperial tank bit or another. 3/4 view showing some arm detail. The piping coming hanging below his arms is a bit crude but whatever. It was simply made from bent paper clip. The Nurgle logo on the shoulder was made from bits of styrene rod and strip. The trophy pole is a bit taller than the poles on Squad Romero which helps to identify Zarak as the boss while simultaneously making him that much more ridiculous looking. His name comes from the binary bonded nebulan partner of the Transformer Scorponok. Scorponok himself invariably has big scorpion claws for hands in all of his iterations, so obviously that is where that comes from. The original G1 Scorponok also had a sunglasses type look that I crudely emulated with a green stuff “visor” over Zaraks eyes. I painted Zarak about a year or so after I painted the other Sin Eater terminators. By then the painting method I was using to get the base colours was slightly different. In the context of the grubby look that I was looking for it doesnt really make much difference. I have always found that when painting a large number of miniatures with the same scheme that the style changes as I progress, usually in an effort to speed the process up. Like many geeks, I like robots and power suits. 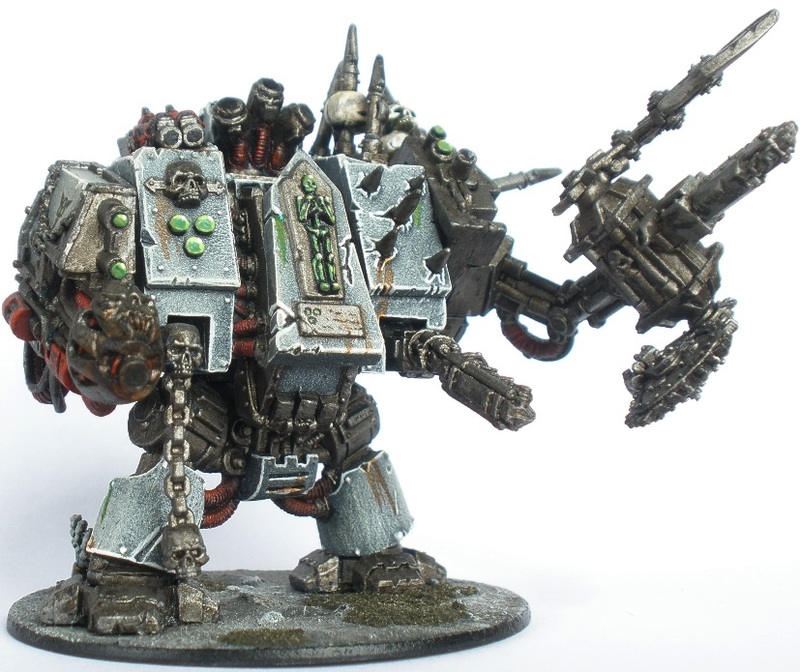 Dreadnoughts and Titans have always been a big 40k draw for me. 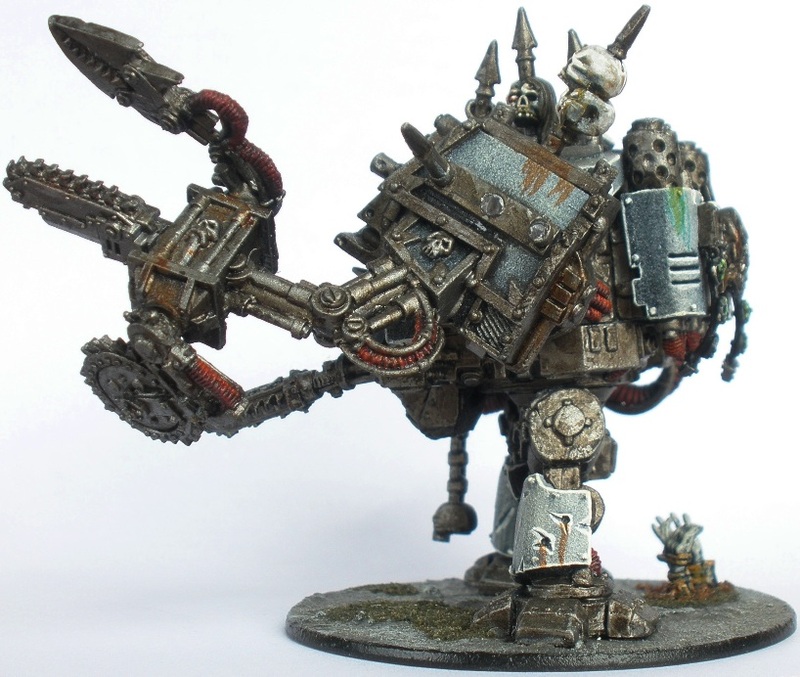 As a result one of the earliest miniatures that I painted for my Sin Eaters Chaos Space Marine Nurgle army was Rhinox. Rear Shot. Just greasy looking metal really. 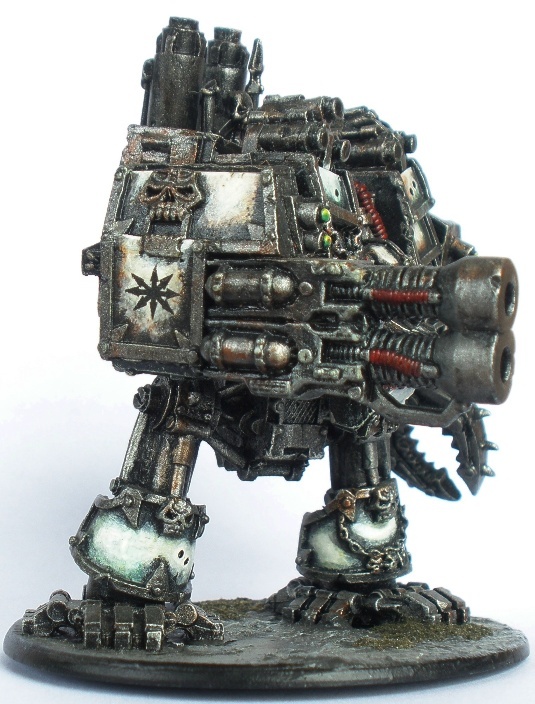 There was only one weapon fit appropriate for a Dreadnought in those days: Twin Lascannon & Power Fist/Claw (I have no idea what, if anything makes Dreadnoughts competitive in the current 40k tournament climate, nor do I wish to know). 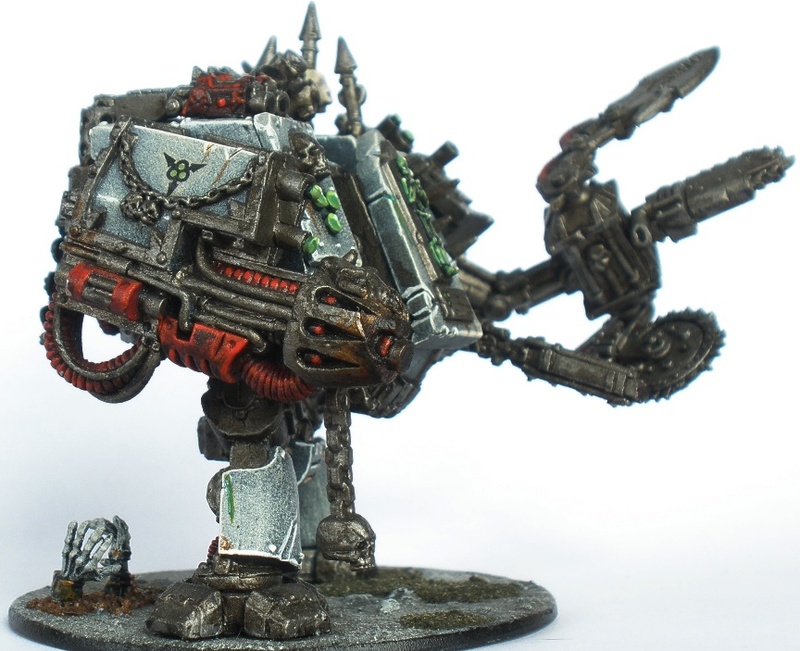 There wasnt a twin-lascannon model available for Chaos Dreads then so I chopped up the twin-autocannon in the box and replaced it with two weapons cut from a Space Crusade dreadnought (I think). Possibly I should have added more detail to the muzzles of the cannon while I was adding the trim that had been removed when cutting the autocannon off. On the other hand it does give the gun a pretty primitive and brutal look that is very suitable. Other than the Lascannon arm the figure is unconverted apart from the added scuffs and dents etc.